(Nanowerk News) Understanding this kind of electronic effects in organic molecules is crucial for their use in optoelectronic applications, for example in organic light-emitting diodes (OLEDs), organic field-effect transistors (OFETs) and solar cells. 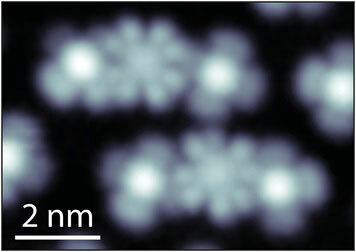 In their article published in Nature Physics ("Many-body transitions in a single molecule visualized by scanning tunnelling microscopy"), the research team demonstrates measurements on the organic molecule cobalt phthalocyanine (CoPC) that can be explained only by taking into consideration how electrons in the molecule interact with each other. CoPC is a commonly used molecule in organic optoelectronic devices. Electron-electron interactions alter its conductivity, which is directly related to device performance. The Atomic Scale Physics group at Aalto University headed by Peter Liljeroth specializes on scanning tunneling microscopy (STM), which utilizes a tiny current between a sharp probe tip and a conducting sample to measure structural and electronic properties of the sample surface with atomic resolution. In this case, they used the STM to measure the current passing through a single molecule on a surface by injecting or removing electrons at different energies. Within the molecule, electrons 'live' on so-called orbitals, which define their energy and the shape of their quantum mechanical wavefunction. These orbitals can be measured by recording the current through the molecule as a function of the applied voltage. Fabian Schulz, a post-graduate researcher in Liljeroth's group, was surprised when the measurements on CoPC molecules did not fit the conventional interpretation of STM experiments on single molecules. "We saw several additional features in the recorded current where there should have been none according to the usual interpretation of these so-called tunneling spectra", Schulz explains. 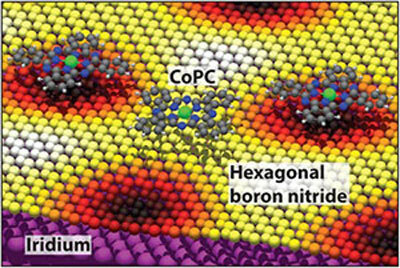 The experiments were performed on cobalt phthalocyanine (CoPC) molecules deposited on a one-atom thick layer of hexagonal boron nitride on an iridium surface. A colleague from Aalto University and leader of the Quantum Many-Body Physics group, Ari Harju, suggested that the key to understanding the experimental results might be a form of electron-electron interaction that usually is neglected in interpreting such experiments. In collaboration with Ari P. Seitsonen from the University of Zurich, Ari Harju and his team calculated the electronic properties of the molecule, including quantum mechanical effects that went beyond prevailing methods. This novel interpretation was confirmed when Liljeroth and his team were able to match the experimentally measured molecular orbitals with the predictions of the theory. "It was very exciting to see this kind of an interplay between theory and experiment", Liljeroth remarks. Ari Harju concludes: "The proof that such theoretically predicted, exotic effects can be observed experimentally is an important step forward in understanding how current is transported across individual molecules and molecular assemblies."